Usually the first scale any guitarist learns when beginning their exploration of the lead side of the instrument, the Minor Pentatonic Scale is both one of the easiest scales to play on guitar, and one of the trickiest to make sound unique and original when applied to a soloing situation. But there are times when you want a more “tense” or “crunchy” sound from your minor-key pentatonic scales, and this is where the Melodic Minor Pentatonic Scale comes into play, as the extra #7 note provides a fun and crunchy melodic device that can be used in place of the normal Minor Pentatonic Scale in your solos. The Melodic Minor Pentatonic Scale is built from the following interval pattern. You can see these notes laid out in tab and notation for an A Melodic Minor Pentatonic Scale here. You can also think of the Melodic Minor Pentatonic Scale as being a fragment of the corresponding Melodic Minor Scale. If you have an A Melodic Minor Scale, A B C D E F# G# A, and you take out the 1st, 3rd, 4th, 5th and 7th notes, A C D E G#, you now have a Minor Pentatonic Scale. To apply this scale in a soloing situation, you can use the Melodic Minor Pentatonic Scale over the minor family of chords, sometimes exactly outlining the chord, and sometimes using the scale to color the chord you are soloing over. It works over Minor chords such as m7, m6, m9, m6/9, mMaj7, mMaj7 and other similar chords. To help get you started, here are two common fingerings for the A Melodic Minor Pentatonic Scale, one with a 6-string root, and one with a 5-string root. 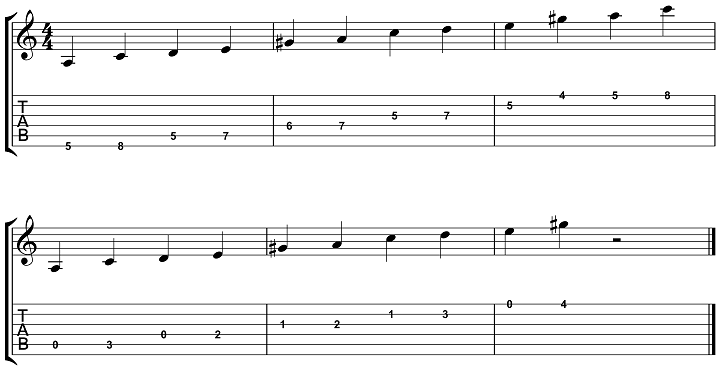 Try memorizing these scales in the key of A first, then take them to the other 11 keys around the neck as you expand on these scale shapes in your guitar practice routine. To finish up, here are a number of ways that you can practice these scales in order to get the fingerings, and theory, behind these scales under your fingers and into your guitar playing. 1. Sing the root note, A for example, and play the corresponding Melodic Minor Pentatonic Scales over that root. 2. Play a root note on the guitar, A for example, and then sing the corresponding Melodic Minor Pentatonic Scale over that root note. 3. Say the note names, or interval numbers, such as A C D E G# or 1 b3 4 5 7, as you play and sing the notes in the above exercises. 4. Put on a static vamp, Am7, AmMaj7 or Am6 for example, and practice soloing over those chords using the related Melodic Minor Pentatonic Scale as the basis for your solo. 5. Repeat any/all of the above exercises in all 12 keys. Do you have a question or comment about Melodic Minor Pentatonic Scales? If so, share them in the comments section below this thread.